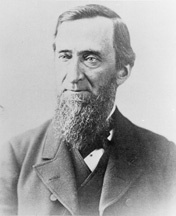 PROCTOR, Redfield, a Senator from Vermont; born in Proctorsville, Windsor County, Vt., June 1, 1831; graduated from Dartmouth College, Hanover, N.H., in 1851 and from the Albany Law School in 1859; admitted to the bar and practiced in Boston, Mass., in 1860 and 1861; during the Civil War enlisted in the Union Army as a major, promoted to colonel, and was mustered out in 1863; returned to Vermont, engaged in the practice of law, and became interested in the development of the marble industry; member, State house of representatives 1867-1868; member, State senate and president pro tempore 1874-1875; lieutenant governor of the State 1876-1878; Governor of Vermont 1878-1880; member, State house of representatives 1888; appointed Secretary of War in the Cabinet of President Benjamin Harrison in 1889; resigned from the Cabinet in 1891 to become Senator; appointed in 1891 and subsequently elected as a Republican to the United States Senate to fill the vacancy caused by the resignation of George F. Edmunds; reelected in 1892, 1898 and 1904 and served from November 2, 1891, until his death; chairman, Committee on Agriculture and Forestry (Fifty-fourth through Sixtieth Congresses), Committee on Military Affairs (Fifty-ninth Congress); died in Washington, D.C., on March 4, 1908; interment in the City Cemetery, Proctor, Rutland County, Vt.
American National Biography; Dictionary of American Biography; Bowie, Chester W. Redfield Proctor: A Biography. Ph.D. dissertation, University of Wisconsin, 1980; Partridge, Frank. "Redfield Proctor." Vermont Historical Society Proceedings (1915): 59-123.